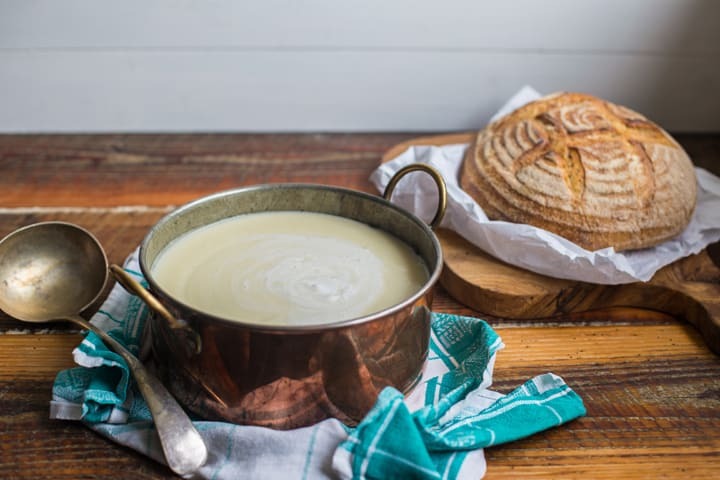 This Comforting Cream of Celeriac Soup is just the job for days when you need a little extra love. It’s dairy free and yet still creamy, smooth and utterly divine. I’ve become rather uptight about food of late. I’d reached a point where I couldn’t see past the last recipe I’d published and was so uninspired about food that I’d started to live on toast. That is the downside of blogging about food, you’re always pushing yourself to invent something new, to create new dishes that will inspire and excite the readers of the blog, and I’d flat-lined. I’d reached the bloggers equivalent of writers block. And so, I released the hold Netflix had on me (farewell Damages – it’s been fun) and instead started watching cookery shows when doing monotonous chores like washing up or editing photo’s. Slowly but surely Jamie, Gordon and the Hairy Bikers have pulled me out of my gastro-slump and once again I find myself excited by food and eager to play with it. And play I did, in creating this culinary cuddle of a soup. Silky smooth and rich, yet fresh with just a hint of spring. It doesn’t taste strongly of celery so please don’t let that put you off. It’s a lovely blend of fresh, clean tasting celeriac, dijon mustard and creamy coconut milk. And it is blooming lovely. On a gentle heat sweat the onion and bay leaf for 15 - 20 minutes, being careful not to colour or crisp the onions at all. When they are translucent and smell sweet, add in the teaspoon dijon mustard and just let that fry for 30 seconds to release the flavour. Pour in the stock (or water and stock cube) and add the celeriac and potato. Pop on the saucepan lid and let simmer for around 20 minutes or until the veggies are soft. Remove the bay leaf and season with the salt, pepper, coconut milk and another 1/2 teaspoon of dijon mustard. Whizz in the blender and when perfectly smooth pour back into the saucepan. At this point you'll have a puree and if that is how you like it, then perfect! However, I like my soups a little on the thin side so I added 1/2 litre of boiling water to get it just right. Serve in bowls or mugs and top with a little of the reserved coconut cream from the top of the can. Delish. Lovely and luscious, your celeriac soup sounds delicious with coconut milk and mustard. Us food bloggers must be on the same wave length as I have a celeriac soup going on the blog tomorrow too. I so know what you mean with that recipe block or however we should call it… I suffer the same thing occassionally… Glad you pulled out of it and am sharing that delicious celeriac soup! I love celeriac and in soup it’s one of the best things! I figured I couldn’t be the only one Simone, but I do appreciate your words. This job rarely feels like hard, but when my foodie brain isn’t playing ball it’s really tough! I know what you mean by food blogging writers block. I had a period last week of eating pancakes and cheese on toast. Your lovely creamy soup just speaks to me. Oh how I would love to eat a warm bowl of this comfort! I admire your photography and food styling skills Janie! I know what you mean – sometimes I really don’t want to think about food, there is a pressure too to always cook something wonderful! I do love celery and celeriac for soups. Comforting, warm and delicious – everything one can ask for in a soup! Oh my, that sounds a dreamy creamy delish dish! I will be seeking out a celeriac soon! Soup photography, have I found my niche??! :D Thanks Johanna, they are kind words. I don’t buy into the whole oneupmanship of blogging. I make a point of never measuring myself against other bloggers (it can swing in a nanosecond between soul destroying or ego-inflating, depending on where you look. I am me. This is my little spot of the internet, and I welcome everyone who wants to learn, share or just enjoys playing with their food too. I have zero time for people that are out to claw their way up or bring others down, and I go all out to support those who ask and are as giving with their time & energy as they are happy to receive. As with every industry there are those that come at it from a selfish, greedy angle but you can spot them a mile of by the lack of community or kindness that surrounds them.